It's a fish with a neckbeard! 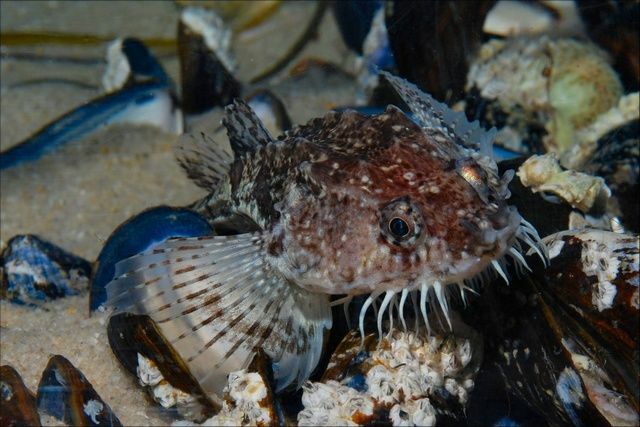 This most uncouth sculpin goes by names such as Armed Bullhead, Hooknose and, a strange one, Pogge. They all sound a bit insulting, which is what often happens to the neckbearded. Alas! Armed Bullheads live in chilly waters around Britain, Iceland and the North Sea, ranging from shallow depths down to over 200 metres (650 ft). 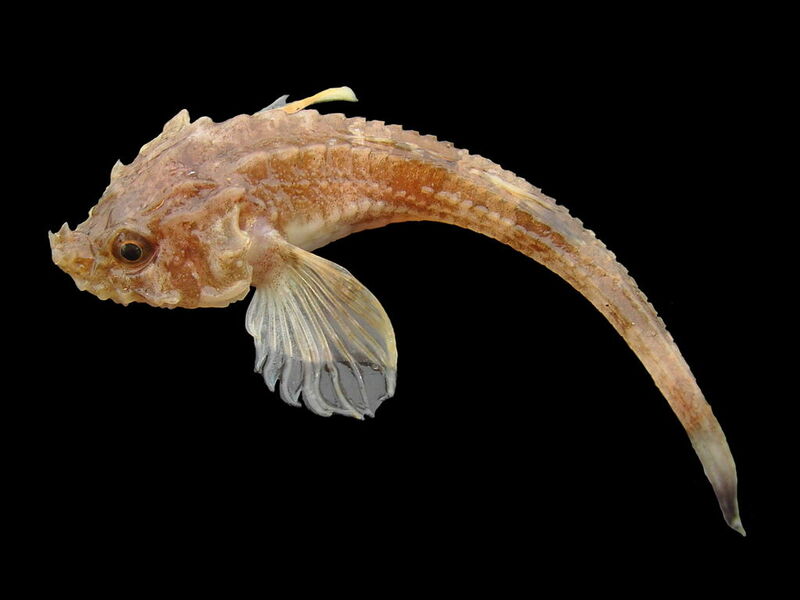 They spend their time on the sea floor, resting on muddy or sandy sediment and swimming in short bursts with their enormous pectoral fins. And then there's that extraordinary beard! 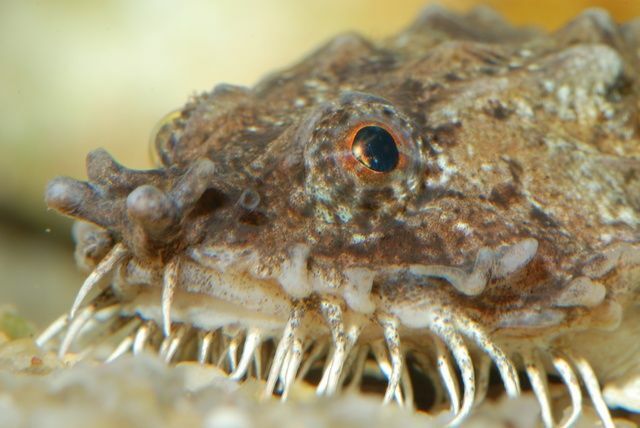 It's composed of an array of barbels, sort of like the ones on a catfish but there are a lot more of them and they cover the underside from mouth to gills. 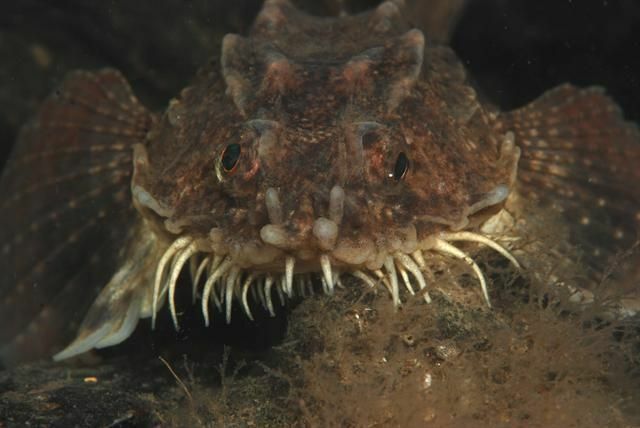 The Armed Bullhead uses them to sniff out worms, crustaceans and other small creatures on the sea floor. Sensitivity doesn't usually go along with neckbeards but this is in fact a sensitive neckbeard. Armed Bullheads are small. A really big one might reach 20 cm (8 in) long but most are little more than half that. 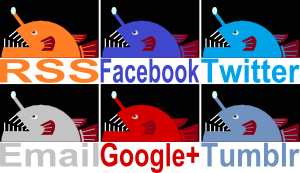 It's a mean and dangerous world out there for a little fish! Even more so for a neckbeardy... probably. What are they to do? The answer is armour. Bony, spiky armour. Armed Bullheads are covered in the stuff! Bony plates from head to tail and numerous rows of spines. Plus another sharp spine on each gill cover AND a pair of spines sticking out of the tip of their ludicrous snout. Clearly, this adds up to a very uncomfortable mouthful for any predator! It also lends them their scientific name Agonus cataphractus. Cataphracts were powerful cavalry used for centuries by many nations and empires dating back almost 1000 years BC. They featured a heavily armoured man sat on a heavily armoured horse. Give the man a pointy stick and you have an elite fighter that would be used by the Assyrians, Persians, Romans and many others, before eventually leading to the knights of Europe. A humble neckbeard becoming a knight of the realm? really quite cute. :) my mother used to say when we were stubborn we were being 'bullheaded'. I guess they have to pretty stubborn to keep that neckbeard! Ha! I guess that would be a different kind of defence! Look out, that bullhead is armed! Oh, no, he was just born that way. Someone could breed a race of humans who are born with guns instead of fingers and he could install them in various positions within society and it would be mean and prejudiced to stop him.